Special players enable teams to win games and championships. The greatest single roster addition for the New York Giants in 2015 will not likely come from free agency or the NFL Draft, but hopefully the return of a healthy and dynamic Victor Cruz. The Giants won their last NFL Championship in 2011. During team’s 9-7 regular season, the Giants finished dead last in rushing and 27th in total defense. It was quarterback Eli Manning (nearly 5,000 yards and six regular-season 4th-quarter come-from-behind victories) who was the catalyst for the team’s winning record. But the other two impact players on offense were wide outs Victor Cruz and Hakeem Nicks. In one of the great Cinderella stories in all of sports, the undrafted free agent Cruz caught 82 passes for 1,536 yards (18.7 yards per catch) and nine touchdowns in first full season. In addition, 2009 1st rounder Nicks caught 76 passes for 1,192 yards and seven touchdowns. Together, Cruz and Nicks were responsible for over 55 percent of Manning’s yardage total as New York finished 5th in the NFL in passing. The Giants barely squeaked into the playoffs in 2011, but they went on an astounding four-game post-season winning streak where the team defeated the 10-6 Atlanta Falcons, 15-1 Green Bay Packers (#1 NFC seed), 14-3 San Francisco 49ers (#2 NFC seed), and 15-3 New England Patriots (#1 AFC seed). Fortunately for the Giants, the team’s defense and ground game finally came alive in the playoffs, Eli brought the team back twice more in the fourth quarter, and Nicks went on a monster 4-game stretch (28 catches, 444 yards, 4 touchdowns). But it was Manning, Cruz, and Nicks who got them to the dance. They were the difference makers. Now obviously there is more than one path to the playoffs and Super Bowl glory. The 2007 New York Giants finished 10-6 with an inconsistent Eli Manning and passing game and the League’s 4th-ranked rushing attack and 7th-ranked defense. It was those latter two units who got the Giants to the playoffs before Eli went on his first post-season tear. However, it will be easier for the Giants to improve their passing game (7th in the NFL in 2014) to elite status than to elevate their defense (29th in the NFL in 2014) and rushing game (28th in yards per rushing attempt in 2014) from the bottom of the NFL to top 10 status in one season. For one, Manning is coming off one of his best seasons and should be far more comfortable in Ben McAdoo’s West Coast-style of offense. Second, Odell Beckham has already arguably become the most dangerous receiver in the NFL. If Cruz can return to his 2011-12 form (168 catches, 2,228 yards, 19 touchdowns), the Giants will have one of the most dangerous passing attacks in the game. Manning-Beckham-Cruz could surpass the 2011 productivity of Manning-Cruz-Nicks. The potential fly in the ointment is obviously Cruz’s right knee. Cruz tore the patella tendon in his right knee in October 2014. Cruz immediately underwent surgery that same month. At the time, a series of articles were written by sports reporters who consulted medical specialists who questioned whether Cruz would be ever be the same player again. After the surgery, Cruz’s trainer predicted the opposite. “I expect him to attack the rehab just like he’s attacked everything else,” Sean Donellan told The New York Post in October. “He loves proving people wrong. He’s been told his entire life, ‘The doors are closed.’ He wasn’t a Notre Dame guy, a Michigan guy. He wasn’t a big-time D-1 recruit. He wasn’t a draft pick. He scrapped his way onto the field, and he’ll scrap his way back from this. “I know a lot of people are saying he can’t or won’t be the same after the surgery, and they have pointed out other players who haven’t come back the same, but I have worked with some of those guys and the difference is Victor will outwork them. Publicly, comments from Giants’ officials have ranged from cautious to optimistic. Predictably, Cruz says he will be back. “The injury’s going well, the rehab’s going very, very well,” Cruz said on March 4. “I’m a little more than halfway there, we’re building the strength back in my leg. The rehab’s been hard, it’s been difficult, it’s been long, it’s been grueling, but I’ve been going through it, man, and it’s definitely paying off now. The strength is coming back slowly but surely. “(The Giants’ medical staff does) a good job of when I’m feeling good, they still tell me things I need to hear to bring me back down to earth a little bit. So they do a good job of keeping me humble and keeping me mindful of the fact that I still have a little ways to go. These steps that I’ve taken so far have been great ones, and they always remind me to send me videos of myself eight weeks ago, ten weeks ago just to remind me how far I’ve come. If Cruz isn’t the same player, it will be a hard hit for the Giants. Without Cruz, Beckham is the only receiver on offense that consistently scares opposing defenses. Wide receiver Rueben Randle and tight end Larry Donnell have flashed, but it remains questionable how good they will become. In fact, a strong argument can be made that if one of the top receivers are available in the first two rounds of the upcoming draft, the Giants should considering adding another potential impact player at a position that once looked settled with Cruz and Nicks. The disaster scenario for Manning and the Giants? What if Beckham gets hurt and Cruz isn’t the same player? Some also point to Cruz’s disappointing season in 2013. Cruz not only missed the last two games of that season with a concussion and left knee injury that required arthroscopic surgery, he was held scoreless and only had one 100-yard receiving game after Week 4. He was also a bit up-and-down in the six games he played in 2014. Though Cruz is an incredibly hard worker, the naysayers will point to off-the-field distractions (both business and social) as well as level of comfort derived from a Super Bowl ring and a huge 5-year, $43-million contract. Cruz isn’t big. He isn’t blazing fast. But when he’s on top of his game, his quickness and ability to read coverages, run good routes, and get open make him one of the best slot receivers in football. New York Giants fans only got to see Cruz and Beckham play together for a little more than a game and a half. They want more. 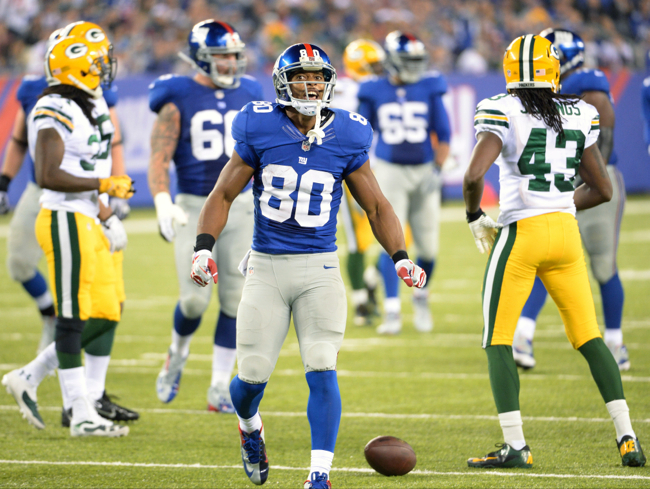 Cruz is clearly at a crossroads… and so might be state of the New York Giants passing offense. No other offseason move can equal the impact of the return of the 2011-12 version of Victor Cruz.